If you manage a Facebook page, you are given the power to post as either your page or your personal profile across Facebook. This has not always been the case and is actually a big benefit to your brand that many people don’t utilize. First of all, you’d better be posting as your page while on the page you control. This seems obvious, but I’ve seen too many people post as themselves on their wall and wonder why no one is seeing the post. Simply, wall posts by anyone other than the page will not go into News Feeds. Unless someone visits your page (which is typically under 2% of your fans), no one will see the post from your personal profile. There are few reasons to post as your personal profile on your page, and most of the times it happens it’s completely out of ignorance and by mistake. If you want access to your fans, you need to post as your page. Posting as yourself and telling people you are the page is just downright confusing. Note that this box is checked by default, so this shouldn’t be a widespread problem. But if page managers are tinkering with their settings and don’t understand what they are doing, they can easily uncheck that by mistake. Sure, I could have posted as my personal profile. 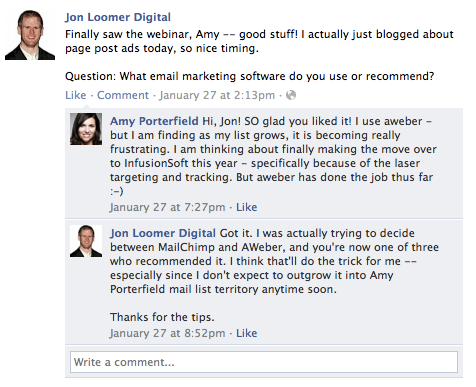 But since the subject matter was relevant to what I do on my page, I posted as Jon Loomer Digital. Now, something I need to say here. There are a lot of people who post as their page on my page who do it in a self-promoting way. Don’t do that. Instead, simply post what you would have posted as yourself. As you can see above, I wasn’t promoting myself. I was seeking Amy’s expertise. But people may click through to my page and like what they see. This is possible since we have similar audiences. Just as important, I want to be on Amy’s radar since she is very accomplished in our field. I have a lot I can learn from her, and she is the type of person I’d like to have in my professionally circle. That doesn’t mean forcing a friendship by any means. But simply putting myself on her radar. So post on the pages of others as your page. Share within the community. Throw around some nuggets of wisdom. But always remember that the stage is not yours. It’s someone else’s. So use similar etiquette that you’d apply to commenting on someone’s blog. Respect the owner, never try to show them up, and always be kind and courteous. 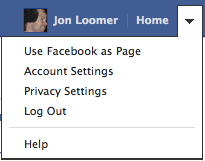 Once you click that, you will now be using Facebook as your page. That means that your “friends” are now the pages that your page has favorited and your News Feed will only consist of posts from those pages. Wherever you post, you will now do so as that specific page. You will then be allowed to pick from a list of the pages you manage and then use Facebook as that page. Using Facebook as your page is an underutilized way to get noticed by page owners and fans of other relevant pages. But never abuse it. Don’t throw around your business card in other people’s stores. Just wear a shirt that says where you work. How about you? 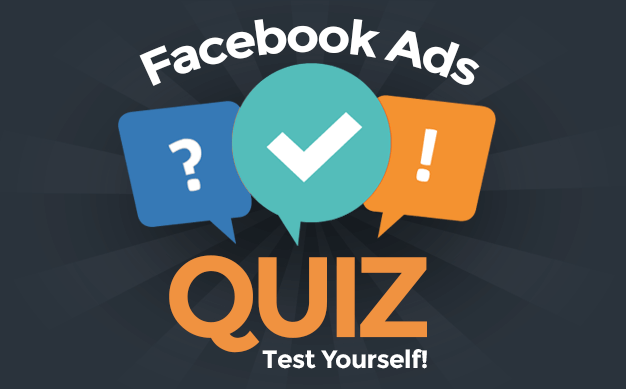 Do you post as your page on other pages? What is your goal and what types of results are you seeing?